The mission of the American Cancer Society is to eliminate cancer as a widespread health problem through research, service, and education. 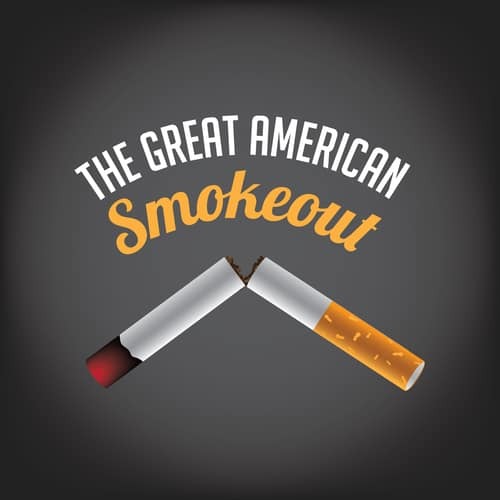 One of their larger events of the year, the Great American Smokeout, occurs on the third Thursday in November. This annual event strives to encourage all tobacco users to designate a quit date and work towards a smoke-free life. The mission at our dental office in Alexandria is to help our neighbors live a healthy, happy life, and not using tobacco is directly related to us fulfilling that mission. So this November, we’re going to highlight a few benefits of quitting as well as a few tips to help. If you’re looking for help to finally quit smoking, or perhaps you’re ready to get your mouth healthy after quitting, we welcome you to call our Alexandria dental office to schedule an appointment. Even it’s been awhile since you’ve been to the dentist or you’ve been a smoker for years, you don’t need to worry about a lecture with us. We believe that supporting you through your journey is much more helpful to getting you healthy. Welcoming patients from Alexandria, Old Town, Del Ray.